Many who are attracted to the idea of a classical education don’t know exactly why, nor do they understand the necessity for Latin, or at least so much of it. A little bit of Latin is a good thing, they say, but every year? Spinach is a good thing, but every day? In classical education, the primary focus of language study is a classical language, and the primary focus of history is the classical civilizations of Greece and Rome. There are two—and only two—classical languages, Latin and Greek. I will confine my comments to Latin. 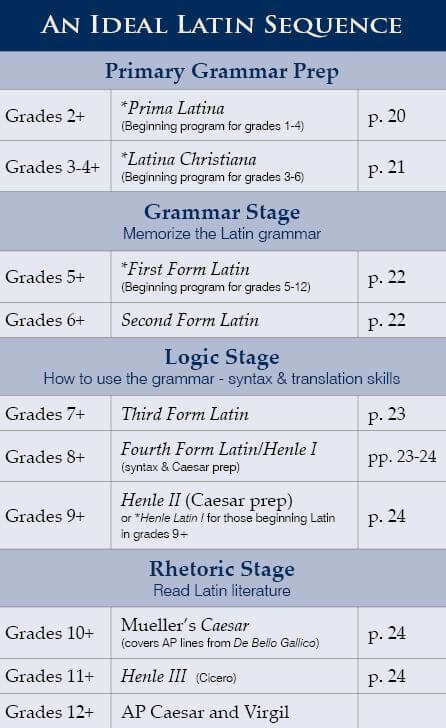 Yes, Latin helps with SAT scores. It does make learning a modern vocabulary easier. True, Latin is abundant in the technical vocabularies of the soft and hard sciences and law. A student of Latin should also gain a firmer grasp on English vocabulary by recognizing that almost all the big words come from Latin. While these benefits are impressive, they are minor compared to the real value of Latin. There are more important objectives that Latin achieves better than any other subject: The first is mental development, and the second is an understanding of English grammar. Latin develops the intellectual powers of the mind as no other subject can. How does Latin do it? In the same way as math. Math is systematic, organized, orderly, logical, and cumulative. In a cumulative study, each skill builds upon the previous one, nothing can be forgotten, and everything must be remembered. All knowledge and skills are interrelated. The student continues to build a tower of learning, block by block, until he has reached a very high level of skill and knowledge. How does math develop the intellectual powers of the mind? Math forms the mind of the student to accuracy, logical thinking, and problem solving. It is formation, not information. Math truly educates, transforms, and changes the mind of the student through its order, logic, accuracy, and organization. The true purpose of education and all of the subjects we study in school is to develop, shape, and transform the mind and character of the student. The nature of the subject transfers its character to the student’s mind. Math is similar to language, and neither is truly a “subject.” They are something much more basic and fundamental than a subject. Astronomy is a subject. The Civil War is a subject. Science, history, literature, government, and sociology are subjects. Subjects are by nature topical. Yes, there are basics to any subject, and, ideally, they are taught in as cumulative a way as possible. If a student doesn’t do well in world history one year, however, he can pick up and do fine the next year in American history. If he zones out during the cell structure, he can wake up and knock off an “A” in the classification system of plants. Math is hard because it builds so relentlessly year after year through every year of the child’s education. Any skill not mastered one year will make work difficult the next year. It is unforgiving. It has to be overlearned. Math is important, but it is secondary to language skills. In fact, math is dependent upon language skills. The math teacher teaches the concepts in words, and the mathematical symbols are used in place of words so they can be easily manipulated on paper. A truly educated person can be pretty lousy at math, because language skills are still the meas ure of the educated person—one who can speak and write with clarity and has power over his native language, English. Latin provides the missing component in modern education, the systematic language training comparable to and balancing the mathematics side of the curriculum. Almost everything I said about math, you could say about Latin, but not English, science, history, or French. Why not English grammar? English is not a classical language; it does not have the structure or form, the logic or the rules. It would be like studying modern architecture or pop music, rather than classical architecture or classical music. English doesn’t follow the rules. The Romans were disciplined, and their language marched in columns, row after row, like soldiers. English is lax and loose, bending and changing wherever it fits our fancy. We are an independent, liberty-loving people, and our language shows it. Languages reflect the culture of the people who speak them. The language influences the character of the people of a nation–and likewise the language is influenced by the people. Furthermore, students have a very difficult time studying their own language. Students have grown up with their own language, and they take it for granted. They are amazingly reluctant to analyze it because they can already put it to practical use instinctively. Beyond that, English grammar is abstract, whereas Latin is concrete. In Latin, you know the direct object because it is in the accusative case. In English, you have to figure it out based on the context. By teaching a language that is very different from English, the student, for the first time, really starts to see how his own language works. His own language comes alive. Modern languages are like English: They lack the structure, form, and logical order of classical languages. Classical languages—Latin and Greek—are so different from modern languages that they seem strange to students. They open up a whole new world and give students the ability to think about language–a very difficult task since students use language naturally. The indirect method of instruction works best with languages, allowing the student to contrast and compare, to see the function of each part of speech and its role in our language. It’s like putting on 3-D glasses so that you can see all the dimensions of your own language. Latin develops and enlarges the mind to a far greater degree than math and brings the necessary balance to the curriculum. Latin, like math, gives the student the experience of studying one subject to a mastery level. This is what is missing in modern education, where we try to teach everything and we cover too many subjects superficially. There are few opportunities to use higher-order thinking skills when you are merely a novice. It is only when the student has studied a subject enough to have some depth that his mind can be stretched and challenged with higher-order thinking skills. Latin and math give students the invaluable experience of studying one systematic subject to a mastery level over a long period of time. This is a key to mental and character development and is the most valuable academic experience a child can have in school. Cheryl Lowe was the author of the popular Latin programs, Latina Christiana Lingua Angelica, and the Forms Series. She and her husband, Jim, were married for forty years and have two sons, both of whom were National Merit Finalists. Cheryl discovered Latin when she homeschooled her sons and was a self-styled apostle of Latin, claiming that Latin has more educational value than any other subject you can teach your children. Cheryl graduated from the University of Louisville with a degree in chemistry and from Western KY University with an M.S in Biology. Cheryl had wide teaching experience, in both content and venue, teaching everything from phonics, reading, math, Bible, and chemistry to Shakespeare and Latin, and teaching in public and private schools, as well as homeschooling. Cheryl and her son Brian founded Memoria Press in 1998 and in 2000, the highly successful Highlands Latin School where all of the Memoria Press products are taught and field tested.